Tyrone McCullagh is a slick, awkward boxer from Derry, Ireland. He won the WBO European title last month in Belfast. McCullagh (12-0, 6 KOs) put on a great performance to beat English Champion Josh Kennedy for the belt. Boxing Insider caught up with Tyrone to discuss his recent wins, rejecting the chance to fight for a British title and more. If you have never watched McCullagh fight, I would advise you to check him out. He fights with a style not often seen, similar in a way to Naseem Hamed, hands down at times, using his quick movement and agility to keep out of range, then peppers his opponent in quick bursts. This is exactly what he done to win the WBO European title and as the fight went on you could see Josh Kennedy become more frustrated by each passing round. How did McCullagh feel about his performance? Did McCullagh expect to be so dominant in the fight? The fight in October was McCullagh’s second title fight in a row, having defeated Scotland’s Joe Ham to win the Celtic title, in what was also a British Eliminator. 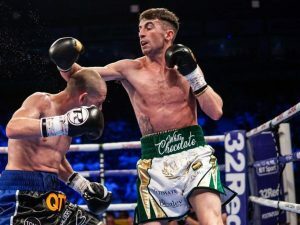 However McCullagh is not interested in fighting for a British title, coming as he does from Northern Ireland, the people there can decide to be British, Irish or citizens of both. Having had a taste of picking up titles, McCullagh wants to get more, with a world title the aim. “I want a world title, obviously not in my next fight but soon. I’ve had a great year and I’m going to build on that next year. McCullagh is also a trained nurse does he still find the time to do some shifts? When asked who has been his biggest influence, McCullagh was quick to answer. So what was it that made McCullagh take up boxing to start with?